These Sketches were read in the shape of Lectures to a class in this University; but it cannot be said they thereby received much publicity. In now publishing them, I have something to disclaim. I trust the origin of the little work may be a sufficient excuse, if it be found wanting in that originality of facts or views without which no one would deliberately compose a book of History. The same cause may obtain pardon for some unacknowledged plagiarism, which it might savour of ostentation more specifically to point out. If the Sketches have any merit, it is in teaching that true History is best to be learnt from the study of its genuine materials, and not from the twice-told tale of the historians of the book-shelves. Here, as in other studies, . . . . Juvat integros accedere fontes Atque haurire. I would warn the young student of history against translations; against abridgments. Let him not think that he learns history by committing a big table of contents to memory. If he takes my advice, his will be the pleasure as well as the gain. He will find endless amusement in the contemporary chronicler, and his rough and vivid pictures of events, which fall very flat and dull, even in the elegant summary of Hume, and the glittering-narrative of Gibbon. But books are not all. The history of a nation has to do with things which books never quite supply ; the manners of the people, their modes of life, action, and thought. We know more of old Rome from a day among its ruins—from a visit to Herculaneum or Pompeii—than from all the compilations of modern historians, or even the mythical narrative of Livy, charming as it is. Above all, look to the real evidence, as the lawyers call it. Judge a people by their institutions and laws; by the cultivation of their soil; by their literature; by their achievements in science and art; by what they have done for civilization, and the happiness of the world. After these Sketches were printed, my friendly publishers, taking, I fear, an exaggerated view of their importance, urged me to prefix some Maps that might serve to illustrate my notions of old Scotland, and its progress. I saw the danger, and it was not without reluctance that I complied. As was to be expected, the Maps led to explanatory Notes and Lists of Places, and other topographical apparatus, which now form such a bulk of preliminary matter. I am not willing to think that the labour bestowed has been useless. Indeed, I believe the information here brought together has not been collected in print before, and may be serviceable to many readers ; and, if so, perhaps I should not be much concerned though critics may discover that my little craft was not built or rigged for such a ponderous freight. No one can hold the book at a lower rate than I do, but that must not prevent me from mentioning the names of some of those who have assisted me, and on whom lies none of the blame of any shortcoming. Mr. Joseph Robertson, my old friend and fellow labourer, has now, as always, been as ready to give, as I to ask assistance. He would be a rash man who should write on Scotch charters or records, or on Scotch church architecture, without taking counsel with Mr. Robertson. Dr. Reeves of Lusk, the historian of St. Columba, who has shamed our Scotch scholars by the light he has thrown upon the christianizing of our western shores, has also assisted me cordially and cheered me on. Mr. W. F. Skene, a Celtic scholar and antiquary of the first order, whose fault is that he will not give his collections to the world, has not withheld them from me. To the last two gentlemen I am indebted for learned and ingenious suggestions upon early Scotch geography, and I feel that I ought to explain why I have not availed myself of them. I am, unfortunately, quite ignorant of the Celtic languages, and the only expositors in whom I have confidence not being entirely at one, I have thought it best not to set down on my map what I could not personally verify. Growth of the feudal system — Later Carlovingians without power — The feudal vassals become independent — Countsof Paris — Hugh Capet crowned king of the French — Settlement of the Normans in France — Old Britain; what remains of Ante-Roman Britain — Language, Institutions — The Normans in France — Their change of manners when settled — Readily adopt feudalism and the privileges of seignory — The Romans in Britain — Their civilization — Roman villas in Britain — Roman towns, roads, bridges — Britain Christianized — Roman colonization gave no independence or self-government — Roman civilization obliterated — The Saxons in Britain — Hengist and Horsa apocryphal — Jutes — Angles — Saxons — Other Teutons — Frisians — King Arthur the only British hero — Anglo-Saxon institutions — King — Hereditary nobility, Thane, Alderman — Churl — Serf — Property of the soil — Folcland — Bocland — Subdivisions and meetings — Scir-gemot — Great assembly of the nation — Christianity restored — Wholesale conversions — Edwin of Northumbria — Caefi, the high priest — Rome endeavours to win over the British Bishops — In vain — Saxon missionaries on the Continent — Alfred — Cnut — The Danes and English — The Norman conquest — The Normans in England — Composition of the army of invasion — Causes of its success — Why the Anglo-Saxon language and institutions prevailed over those of the conquerors. Earliest Writing — Charters — Chronicles — Old Scotch collections of laws — The Berne MS. — The Ayr MS. — Materials of early history — State papers from Alexander III. — Records of Parliament from Robert I. 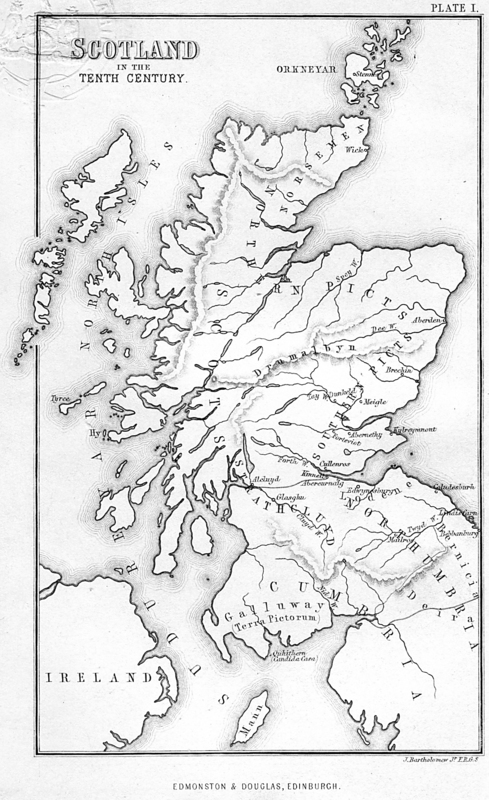 — Barbour, Wyntoun, Fordun — Scotland in the twelfth century — Scots — Picts — Lothian — The Norse settlement — Strath-Clyde — Cumbria — Language of old Scotland, Celtic — After Malcolm Canmore, tendency to anglicize — Scotch princes anglicizing — The Scotch courtiers and settlers all Saxon or Teutonic — Northumberland under David I. — Walter Espec at the battle of the Standard — David's troops — The Galwegians — The Scots — Bruce at the battle of the Standard — Early Christianity — Saint Ninian — Columba — Iona — Conversion of Northumbria — The see of Lindis-farne founded — AEdan Bishop of Lindisfarne — St. Cuthbert—Iona the source of Christianity in Scotland — The Culdees — Their later irregularities — Ancient Bishoprics restored by David I. — Munificence to the Church — David I. — His character. Short period of prosperity under Macbeth — David's reign the beginning of a new policy and of long prosperity — Royal progresses — Great officers of state — The king's household — Sources of revenue — Demesne lands — Burghs — Feudal casualties — Customs and duties — Fines and escheats — Items of royal expenditure — Warlike defence — Hunting and hawking — Gardening — The king's tailor — Gascon wine — Meat — Salted marts — Fish — Country life of the king — Royal parks — At Stirling — At Jedburgh — Nobles of the Scotch court — Great earls of Stratherne — The Bruces — The Stewarts and their followers — Knightly occupations — War — The chase — The Stewarts' preserved forest and park — Studs of horses — The Church — The secular clergy — Parish churches bestowed on monasteries — The Church — Monachism in Scotland — Monasteries — Their education — Schools — The arts and trades practised in the Convent — Life in the Convent — Early rental of Kelso — Rural population under the monks — Nativi — Serfs — Price of serfs — Serfs emancipated by the Church — Some light on the condition of serfs — Emancipation of serfs — Agriculture — Roads — Carriages — Mills — Agriculture of the monks. 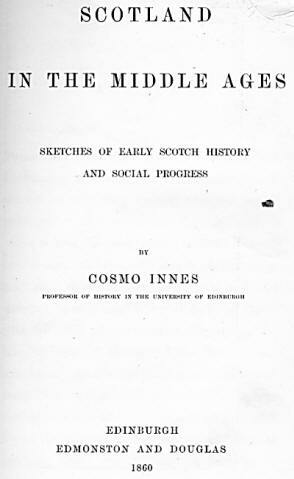 Roman Institutions remaining after the overthrow of the Roman power — Municipal Institutions — Spanish Fueros — German free cities — Hanse Towns — English burghs — Scotch burghs — The Scotch laws of the burghs founded on old customs of English and Scotch burghs — Election of Magistrates — Who were the electors? — Scotch burghs more ancient than any charters — Berwick — St. Andrews — Edinburgh — Rutherglen — Perth — Perth burgh charter — Aberdeen — Inverness — Ayr — Churchmen's burghs — Glasgow — Court of the four burghs — Beauty of Scotch towns — Burgesses. Ancient, customary, and common law — Celtic law of succession — Celtic marriages — No general change of law — AEstimatio personarum — Ancient law of compensation — Criminal law — Wager of battle — Compurgators — Trial by battle — Trial by fire and water — Law of ordeal — Proof by witnesses gradually admitted — Penalties of theft — Penalty of slaughter — Four pleas of the Crown — Laws of Galloway — Galloway customs — Law of sanctuary — Church girth — Famous sanctuaries — Stow in Wedale — Lesmahago — Inverlethan — Tyningham. Early Tenures — Bruce charter — Dundas charter — Charter to the Steward — The Stewarts' charters — Legal fiction that all property belonged to the Crown — First Stewart charters — Early tenures — The Baron's court — Suit, and service — Composition of the king's court — National Council; its composition in early times — Communitas regni — Taxes, how imposed of old — Parliament, when first so called — Burgesses in Parliament — Grant of aid — Conditions of the grant — Committees of Parliament — Committee of Articles — Judicial committee — Institution of Court of Session — The Lords of the Articles — Representation of small freeholders — Representation of burghs — Officers of state with seat in Parliament — All sat together — Defects of the Scotch Parliament. Early utensils — Cups of glass — Boats and galleys — Scotch pearls valued in the twelfth century — Costly horse trappings and armour — Early manufactures — Ancient herring fishery — Mines of gold, silver and iron, worked — Early trade — Riches of the burghs — Berwick — Cnut the Opulent — Munificence of the burgesses of Berwick and Roxburgh — Ship-building at Inverness in the thirteenth century — Coal worked — Merchandise — Commodities traded in, in the twelfth century — Duties of export and import — Customs of Scotch ports in the fourteenth century — Old burgher life — Magistrates — Merchants' ledger of the fifteenth century — Halyburton, a Scotch merchant settled at Middleburgh — His correspondents, persons of all ranks in Scotland, up to the Prince, Bishop of St. Andrews — Scotch goods consigned to him — Wool — Hides — Skins — Salmon — "Claith" — Returns in Wine — Malvoisie — Claret — Rhenish — Canvas — Fustian — Velvet — Damask — Satin — Spices — Roman Bulls of dispensation for marriage — Tayssillis — Soap — Rice — Sugar valans — Scroschats — Sugar lacrissie — Sugar candy — Feather beds — Candlesticks and hanging chandeliers — Pewter dishes — Dornyck — Table linens — Arras coverlets, pots, and pans — Ryssil broun (cloth) satin — Bugles, silk and gold thread (for embroidery) — Bear — Almonds — Raisins — Figs — Olives — Apple oranges — A signet of silver, and one of gold — The bishop's round seal and long seal — Silver chalices — Board cloths with towels and serviettes — Flanders cloths — Bonnets — Caps — An orloge mending — Raised work— A gown of ypres, black lined with say — Doublet of camlet — Pair of hose — Kist of iron work — Plate — A mat for the Bishop's chamber — Tiles for his chamber floor — Woad and Bryssell — Books of both laws — Review of Scotch trade.